Exile’s Song is a fascinating look at the culture of Darkover from someone belongs to the world but is able to see it from an outsider’s point of view. As an independent, educated, intelligent female, Margaret Alton is dismayed and shocked by some of the aspects of this patriarchal society. She has been left in the dark about much of her heritage, so an element of mystery/ discovery carries the story along as she tries to sort out the pieces of her destiny. While the “torn between two cultures” has always been a major theme in Bradley’s work and the Darkover novels especially, this book feels far more intimate and poignant than the usual 3rd person narrative. Perhaps it is just the passion and detail with which Bradley returns to her favourite planet as she creates a new era , one for which she’d laid the groundwork over a decade before. 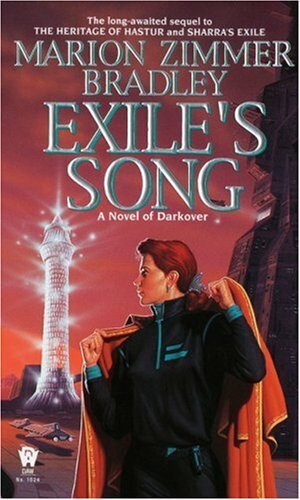 Exile’s Song was written a full 15 years after Sharra’s Exile and marks Bradley’s epic return to the beloved world that she created. It sets in motion characters and events that will spread over several other books (one of which was finished posthumously by Deborah J. Ross) that form the closing chapters in the official Darkover timeline. Like other famous and much loved sagas (Star Trek, Star Wars, Dune etc.) there will be fan fiction and perhaps even other stories yet to come. But things change in a world once the creator of it passes on. Exile’s Song has a wonderful ending that could allow it to stand on its own, but I am glad Marion continued with their adventures up until her death(and beyond). Paperback format, 493 pages, published in 1996 by DAW Books. 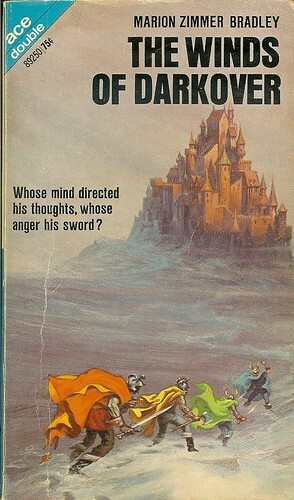 This was a summer for rediscovering and rereading the Darkover books in my collection. Thanks to the Internet, I was able to read a great plot summary for The Heritage of Hastur, one of the novels still missing from my collection despite my best attempts to track down a used copy at a reasonable price. I wanted to remind myself of the basic plot before I moved on to Sharra’s Exile. 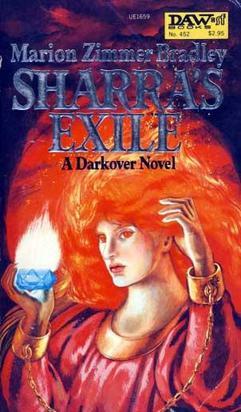 Sharra’s Exile covers a pivotal time in the history of Darkover and the planet’s relationship with the Terran Empire. The books seems to stand as a bridge between Bradley’s earlier Darkover novels, each written as shorter stories about a world that she loved, and the later, thicker novels that went into much more detail about the vast world and intricate society that she’d created. This novel begins the “modern” era of Darkover. The planet is no longer the isolated, feudal world that grew from the descendants of a lost Terran Colony. Sharra’s Exile is about a unique world trying to find a way to belong to something bigger than itself, without losing its own identity. Various players on both sides of the issue plot for Power above all. When a legendary force resurfaces from an ancient Matrix Weapon, will it be used against the Terrans to drive them out or will it shake apart the very world from which it was born? Sharra’s Exile is a gripping multiple-narrative book that is handled exceptionally well. I often find books that jump around to different character’s perspective confusing at best, but somehow Bradley’s deft touch lets the different narratives overlap at times and offer more than one point of view about certain key events. This keeps the reader as more of a neutral observer with excellent box seats to an epic adventure rather than being caught up in only one person’s point of view… and it works exceedingly well with such a complex tale. The additional details about Regis Hastur in the new Hastur Lord that I read earlier in the challenge, made reading this older novel far more rewarding this time. I cannot wait to reread more about Regis Hastur, the Altons and how these strong-willed people grow to shape a planet’s destiny! Paperback format, 365 pages, published in 1981 by DAW Books. Haunting used book stores lead to the ultimate temptation and a duplication in order to fill a missing spot in my Darkover collection. Having found The Spell Sword on its own as a used copy, I discovered the 2002 Daw Omnibus Edition called The Forbidden Circle just a few weeks later, containing both The Spell Sword from 1974 and The Forbidden Tower from 1977 reprinted in one edition. I broke down and decided that I would rather end up with two versions of The Spell Sword for now rather than miss out on reading one of the missing stories. The Forbidden Tower fits into an interesting part of Darkover’s history when a few Terrans actually found their place truly belonged among the local culture and way of life. Like Magda Lorne in Thendara House and City of Sorcery, Andrew Carr is a Terran who has chosen to join Darkovan society. Luckily for him, the Terran Empire thinks him dead in the plane crash that takes place during the events in the Spell Sword. The Forbidden Tower follows the trials and tribulations of Damon Ridenow and Andrew Carr as well as Ellemir and Callista Lanart, twin sisters. These four central characters from The Spell Sword now face the convoluted future that their choices had laid out for them. A Future that will not only question almost every tradition that the telepathic society of Darkover holds sacred, but possibly risk their lives as well if they stand up for what they believe in. The most fascinating thing about this novel is the pathos with which the main characters wrestle with basic cultural assumptions and traditions. This is made even more startling when you add in the mix of an “offworlder” with his own cultural bias and taboos. Bradley does a masterful job of challenging the reader to understand “that’s the way it has always been done” is not a reason to accept something without question. True evolution, whether it be ethical, societal, cultural, personal or spiritual must include being able to ask questions and discover the answers for yourself. Paperback format, 570 pages, published in 2002 by DAW Books. My quest to haunt used bookstores and complete my Darkover collection brought unexpected results this week when I managed to find an old copy of The Winds of Darkover as an ACE Double book. Sold in the 1970s for 75 CENTS (You can say what you want about inflation, but the fact remains that book prices now are outrageous and I think literacy is suffering as a result) ACE Double books contained 2 novels and 2 covers. You just flipped the book over to read the other novel when you were done the first one. The only drawback to putting your book down on a table open somewhere is that it is very easy to pick it up the wrong way and have a momentary headache when all the text is upside down! The Winds of Darkover is the story of Terran Dan Barron, a spaceport dispatcher who is forced to switch duties when a strange hallucination/vision distracts him and almost causes a spaceship to crash. He is sent off into the wilds of Darkover, a rare experience for most Terrans on this closed world. The strange visions continue and cause him to feel as if he is leading a double life. Dan is sure that he has never set foot on this world before… so why do parts of it seem so familiar? Why is he able to speak the language so fluently? Why does it feel as if he is splitting into two people? 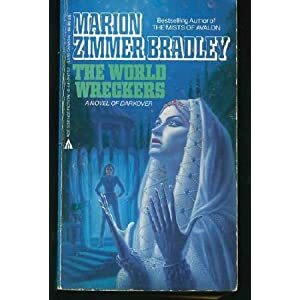 Like most of the Darkover novels, Marion Zimmer Bradley wrote The Winds of Darkover to be a stand alone story… yet the overlap of some familiar characters is enjoyable to say the least. The multiple narrative suits both the story and the pace at which all the different points of view come together. The depth of emotion that Bradley is able to draw from her characters and the trials they suffer as they discover how to be true to themselves is one of the things that has always drawn me to her writing and this series in particular. While The Winds of Darkover is the Darkover book that I have reread the least often over the past 25 years, it was wonderful to discover my own copy at last to add to my library and contained many details I’d forgotten about this amazing planet and society that Bradley created. 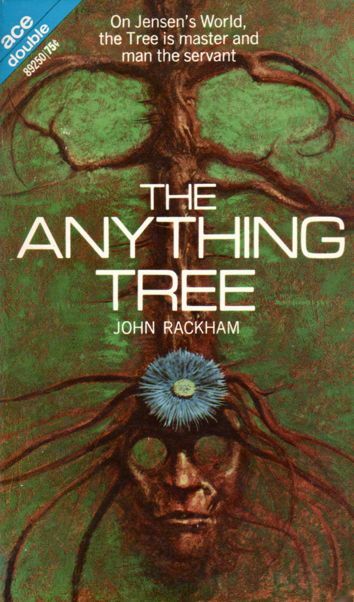 Paperback format, 139 pages, published in 1970 by ACE Books. It was with some trepidation that I opened Lament after my youngest daughter finished reading it. Maggie Stiefvater’s Shiver was one of the best new books I’d read a few years ago in the YA category, but the mucking about that she did to the story line with the rest of the trilogy left a bad impression to say the least. In my opinion, Shiver remains strongest as a stand alone novel and I felt totally disenchanted by the thought that a trilogy was more marketable and profitable. Shiver’s story was so strong, the ending so startling that I felt in awe of all the possibilities that lay before the amazing characters. Then the two other books totally ripped apart what I had hoped and imagined, culminating in one of the most dissatisfying conclusions to a series I’d ever experienced. Given this bias, I am amazed that I added Lament to my challenge list. The first few chapters were hard. I found myself thinking that the “impossible odds love story” was just too formula, too predictable and too “young”. Slowly, Stiefvater’s incredible style and descriptive prose drew me in. I fought it. I didn’t want to be drawn into another tale only to hate where the author would lead me. When the love triangle emerged, I nearly groaned. Is there no other plot line for young women to read these days? Visions of Team Edward and Team Jacob began to blur my vision. Luckily, the swift pace of the plot pulled me on and I ended up finishing 3/4 of the novel in a single gulp. Lament’s ending is wonderful, poignant and satisfying. I was also surprised to discover that this novel was actually written BEFORE Shiver, Linger and Forever. The writing seems as mature and polished as in Shiver, so it didn’t feel like a “younger” work. The novel didn’t try to wrap everything up in a neat package and allowed me to imagine how the story would unfold after this glimpse. The fact that there is another novel written about one of the characters now intrigues me rather than filling me with dread, so I may see if I can find a copy of Ballad to read before the year is out. Just tell one good story at a time.